Gertrud Heartfield Death 1983. John Heartfield’s Third Wife Was His Constant Companion. Gertrud Heartfield Death 1983.The Passing Of John Heartfield’s Third Wife & Constant Companion. Between 1968 and her death in East Berlin in 1983, Gertrud Heartfield continues to exchange many letters with John Heartfield’s son, Tom George Heartfield, and this exhibition’s curator, John J Heartfield. These letters are part of The John J Heartfield Collection. As the exhibition expands, the letters be available to read in the Life As A Fighter -> Words & Images -> John J Heartfield Collection section of The Official John Heartfield Exhibition and Archive. Tom Heartfield’s family enjoyed Gertrud’s company in Italy in the 1950s and 1960s when she and John Heartfield could obtain temporary visas from East Germany. Gertrud was a charming intelligent woman. She was always there to take care of Heartfield and ground him. Her calm good-natured personality was an excellent match whenever John Heartfield’s excitable emotional side emerged. Gertrud “Tutti” Heartfield was a blessing to John Heartfield in many ways. This exhibition’s curator can honestly write that she always did her best for his grandfather. John J Heartfield remembers Gertrud Heartfield as his dear adopted grandmother. Professor John J Heartfield is John Heartfield’s paternal grandson. 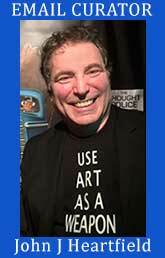 Professor Heartfield presented Art & Politics, Politics & Art at the DADA WORLD FAIR in San Francisco. Please write to him about his live presentation regarding the relevance of his grandfather’s life and work to current events.